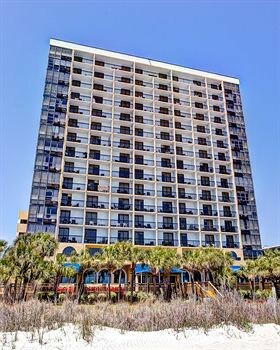 Property Location When you stay at Sun N Sand Resort in Myrtle Beach, you&apos;ll be on the beach and convenient to Art Museum of Myrtle Beach and Midway Park. This beach resort is within close proximity of The Market Common and Myrtle Beach State Park.Rooms Make yourself at home in one of the 224 air-conditioned rooms featuring refrigerators and flat-screen televisions. Complimentary wireless Internet access keeps you connected, and cable programming is available for your entertainment. Private bathrooms with shower/tub combinations feature complimentary toiletries and hair dryers. Conveniences include desks and microwaves, as well as phones with free local calls.Rec, Spa, Premium Amenities Take advantage of recreational opportunities offered, including an outdoor pool, an indoor pool, and a fitness center. This resort also features complimentary wireless Internet access, concierge services, and wedding services.Dining Enjoy a satisfying meal at a restaurant serving guests of Sun N Sand Resort. Relax with your favorite drink at a bar/lounge or a beach bar.Business, Other Amenities Featured amenities include complimentary newspapers in the lobby, a 24-hour front desk, and laundry facilities. Planning an event in Myrtle Beach? This resort has 3900 square feet (351 square meters) of space consisting of a conference center, conference space, and meeting rooms.